DANA POINT — At the inaugural RBOC Boaters’ Forum, Southern California boaters had a rare opportunity to hear directly from representatives of Sacramento-based Recreational Boaters of California, a boater advocacy group whose goal is protecting the interests of California’s recreational boaters. The forum was held Feb. 29 at Dana Point Yacht Club — and the “hot topic” was the recent unveiling of Gov. Jerry Brown’s plan to eliminate the Department of Boating and Waterways (Cal Boating). RBOC’s director of government relations Jerry Desmond Jr. explained why local boaters should be concerned — and what they can do to stop the plan. RBOC representatives fear that if Cal Boating is folded into the Department of Parks and Recreation as recommended in Brown’s budget plan, recreational boating fees and taxes used to construct boating facilities and infrastructure improvements will be diverted to fund non-boating activities — and current funding and loan opportunities for building and maintaining public and private marinas in California would be eliminated entirely. “Eliminating the Department of Boating and Waterways could have an impact — even right here in Dana Point,” Desmond said. He pointed out that Cal Boating loans were used to construct Dana Point’s new harbor launch ramps. In addition, OC Dana Point Harbor Director Brad Gross, who attended the meeting, said he is expecting more than $24 million in loans to help fund future Dana Point Harbor revitalization plans — funds that could be unavailable if Cal Boating is eliminated. 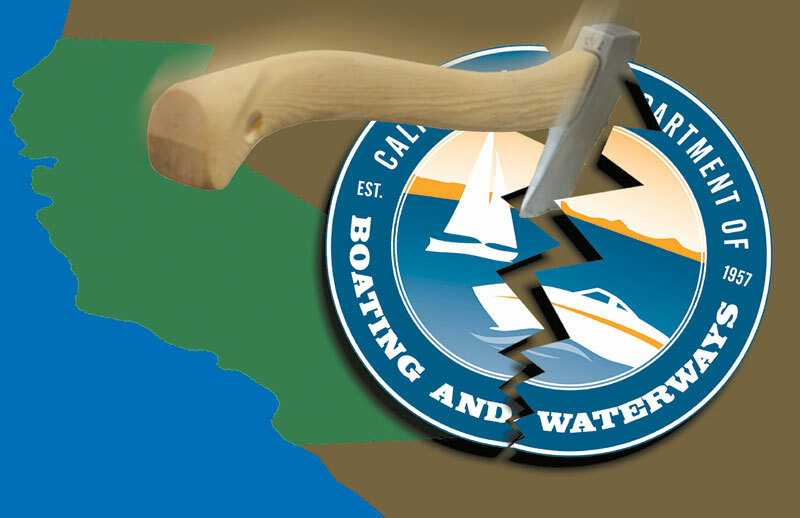 On March 7, Desmond’s concerns appeared to be validated by a report from the California’s Legislative Analyst Office recommending that California legislators eliminate Cal Boating’s marina and small craft harbor loan programs as a state budget-cutting strategy. The issue is not a new one for California or RBOC, as Brown’s attempt to merge Cal Boating into the Department of Parks and Recreation marks the fifth time the department has been targeted for elimination since 1990. Similar plans were floated by former governors Pete Wilson and Arnold Schwarzenegger. Through the years, RBOC has lobbied in Sacramento and created outreach efforts with the boating community to help preserve Cal Boating, fighting to keep alive a department they believe the government views as a “money tree” — and an easy target. Brown would reduce the number of state departments from 12 to 10 and eliminate 39 state agencies. The governor’s budget summary outlined three reasons for folding the Department of Boating and Waterways into the Department of Parks and Recreation: First — the two departments already work together on facility construction projects; second — it has been done before (to merge the Off-Highway Vehicle Recreation Division into the Department of Motor Vehicles); and third — money from Cal Boating, generated by fuel tax paid by boaters, is already being diverted to the Department of Parks and Recreation. While the new budget plan claims to create a more efficient and cost-saving government, Desmond explained that merging Cal Boating does not accomplish those goals, since the department does not require support from the state’s General Fund. A total of 75 percent of Cal Boating’s $69 million budget comes from boater registration fees, fuel taxes and interest paid back from boater infrastructure loans; and the remainder comes from federal funding. So why is Cal Boating being targeted, if it is self-sufficient and efficient? RBOC believes the merger will divert the funds generated by boaters’ fees and taxes to ease the budget shortages at the Department of Parks and Recreation. And with the potential elimination of the California Boating and Waterways Commission — a board that oversees and advises where Cal Boating funds should be spent — ensuring that boater-generated dollars are spent on boating-related facilities would be much more difficult. RBOC is working to fight the plan to eliminate Cal Boating, with stepped-up lobbying efforts in Sacramento and a “Call to Arms” for recreational boaters to once again voice their opposition. RBOC delivered more than 1,200 “Save Cal Boating” letters to Gov. Brown’s office in February, and another 1,000 were delivered March 12. Desmond said he expects Brown’s budget proposal to be introduced to the California Senate as a Budget Trailer Bill. A 600-page bill would be introduced that includes all of the department’s budgets, but “trailer bills” would be tacked on that include all of the statutory changes to the budget. If introduced in this manner, the bill would only require a majority vote of the Senate to pass. “This is not a partisan issue here: We need friends on both sides of the aisle,” Desmond said. The first scheduled hearings for the budget proposal are March 21 and March 28 in Sacramento, where further details regarding how the bill will be presented should emerge. Boaters can sign and submit a letter of opposition to Gov. Brown’s proposal to eliminate the Department of Boating and Waterways by visiting RBOC’s website: rboc.org. Also, boating organizations looking to show support can email rboc@rboc.org, with the subject line: “add us to the list.” In the body of the message, provide the organization’s name and confirm that you are authorized to provide RBOC with permission to include the organization on its list.